Until Darwin: Science and the Origins of Race: Found Object: 1946 Letter from E.S. Rohde to Mrs. C. Beamiss inside of Rodhe's The Story of the Garden. 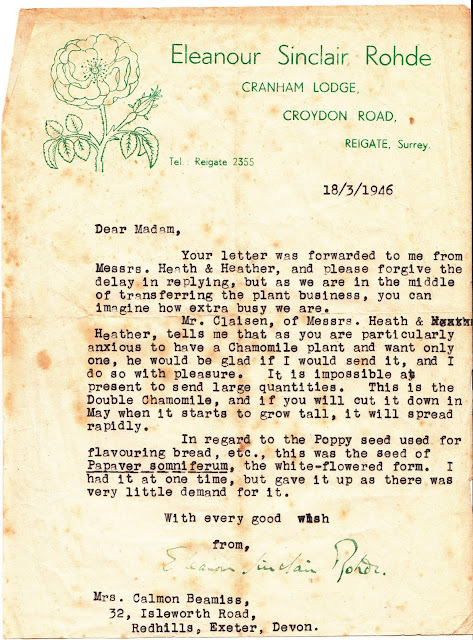 Found Object: 1946 Letter from E.S. Rohde to Mrs. C. Beamiss inside of Rodhe's The Story of the Garden. A couple of years ago I purchased a copy of Rohde's The Story of the Garden. Inside was a letter from Rohde to "Mrs. Calmon Beamiss" of "Redhills, Exeter, Devon." Below is the letter as well as the preface from Rohde's Story of the Garden. 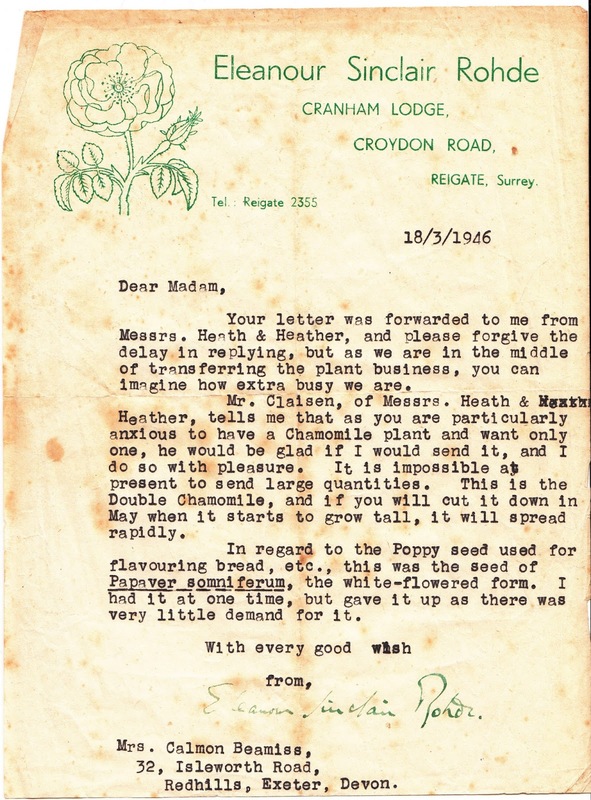 Your letter was forwarded to me from Messrs. Heath & Heather, and please forgive the delay in replying, but as we are in the middle of transferring the plant business, you can imagine how extra busy we are. Mr. Claisen, of Messrs. Heath & xxxxx Heather, tells me that as you are particularly anxious to have a Chamomile plant and want only one, he would be glad if I would send it, and I do so with pleasure. It is impossible at present to send large quantities. This is the Double Chamomile, and if you will cut it down in May when it starts to grow tall, it will spread rapidly. In regard to the Poppy seed used for flavouring bread, etc., this was the seed of Papayer somniferum, the white-flowered form. I had it at one time, but gave it up as there was very little demand for it. Eleanour Sinclair Rodhe. 1932 (reprinted 1933). 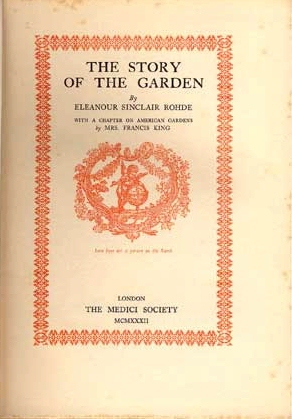 The Story of the Garden, with a Chapter on American Gardens by Mrs. Francis King. Boston: Hale, Cushman & Flint, Publishers. "The frontpiece of this book is from the original picture in Colonel Messel's collection and reproduced with his kind permission. I am delighted to be able to include a chapter on American gardens by Mrs. Francis King, whose books are a great source of pleasure to English as to American garden-lovers. Parts of this book have appeared in article form in The Field and The Bookman and are reproduced by kind permissions of the editors. 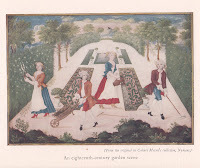 I am indebted for the illustration of one of the patron saints of gardening -- Saint Fiacre -- from a miniature in a manuscript in the Bibliotheque Nationale, to Mrs. Roy Hunt of Pittsburgh, Pennsylvania, who most kindly sent me a reproduction of it." The vignette on the title-page -- 'Love lays out a Garden on the Earth' -- is from an eighteenth-century gardening book -- not merely a charming 'conceit' of that period, but a beautiful ideal which I think appeals to us all.